Amazon has been making Kindles for ten years, and with every new generation there have been iterative improvements. 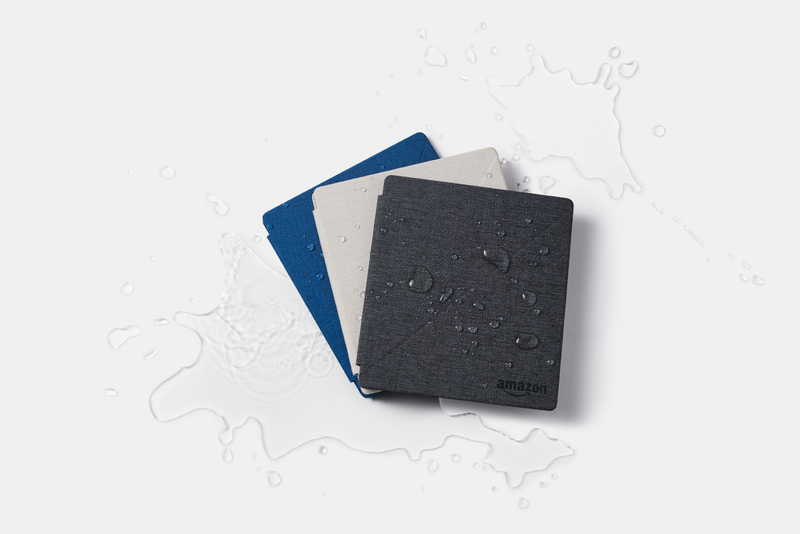 Image and font quality have improved, the e-ink display has undergone incredible improvements, the devices have gotten thinner and lighter, but one of thew few things that Amazon hasn’t done is make Kindle waterproof, until now. The standout feature of the new Kindle Oasis is its IPX8 rating. This means that it can be submerged in up to two meters of fresh water for up to 60 minutes. The new e-reader has a larger 7-inch, 300 ppi display, the fastest page turns of any Kindle e-reader. The device has a unique shape which tapers to an ultra-thin 3.4 mm display which Amazon says features their strongest cover glass and a new aluminium back. Despite the larger screen size, the new Kindle Oasis weighs only 194 grams, 10 grams less than the Kindle Paperwhite. The device comes in two storage options – 8 GB, which has twice the storage as the first Kindle Oasis, and can hold thousands of titles; and 32 GB, allowing you to store even more rich content with large file sizes, like Audible audiobooks, comics, newspapers, magazines, and more. Audible will be available on the new Kindle Oasis via a free over-the-air update when the device ships—and it will be available via a free over-the-air update to Kindle (Gen 8) and the first Kindle Oasis in the coming months. New Font Size and Bold Settings: Now choose from more font sizes than ever before—and five levels of boldness—for whichever font you choose to read with. rce font created to increase readability for readers with dyslexia), Amazon has also added a feature to invert black and white on the display if you have light sensitivity. The new enlarged display option also lets you increase the size of items like the text on the home screen and library as well as the book icons. Light Settings: Built-in ambient light sensors will automatically adjust the display to your surroundings whether you’re in a dimly-lit room or outside in the sun—and can be fine-tuned even further based on personal preferences. The new size and bold settings as well as ragged right alignment will be delivered as a free, over-the-air update to Kindle Paperwhite (Gen 6 released in 2013), plus all newer Kindle devices. Whispersync and Whispersync for Voice—Saves and synchronises your last page read, bookmarks, and annotations from your Kindle eBook and Audible audiobook across all of your Kindle devices and apps, so you can always pick up where you left off on any device, whether you’re reading or listening. You can even switch between reading and listening on the same device and Whispersync will keep you in the right place in the story. Looking for a new e-reader? Shop our full range of Kindles. Which Kindle is perfect for you?